Preheat oven to 350 degrees. Combine together first 7 ingredients with 1/3 cup mushroom soup. Cook mushrooms and drain. Add 1/4 minced mushrooms to patty mix. Mix remaining mushroom soup, and milk until smooth. Add remaining mushrooms. Spray 9×9 pan. Pour half of mushroom soup mixture to the pan so that it forms a layer on the bottom. Heat skillet with oil to cover bottom of skillet. Form beef mixture into patties (makes approximately 5 depending on size). Add to skillet and brown on each side (approximately 3 minutes per slide). When done, place in pan. When all patties have been browned, cover with remaining mushroom mixture. Bake for 30 minutes or until patties are cooked through. 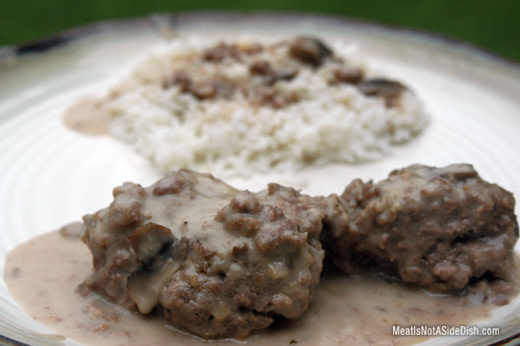 Serve Salisbury Steak with noodles or rice.